Some Republicans think state party leader Susan Hutchison should resign after her apparent rationalization of Trump’s 2005 comments about groping women. The remarks Donald Trump made in 2005 about groping women have divided Republican leaders at the national level. It’s also driving a wedge between Republicans here in Washington state. 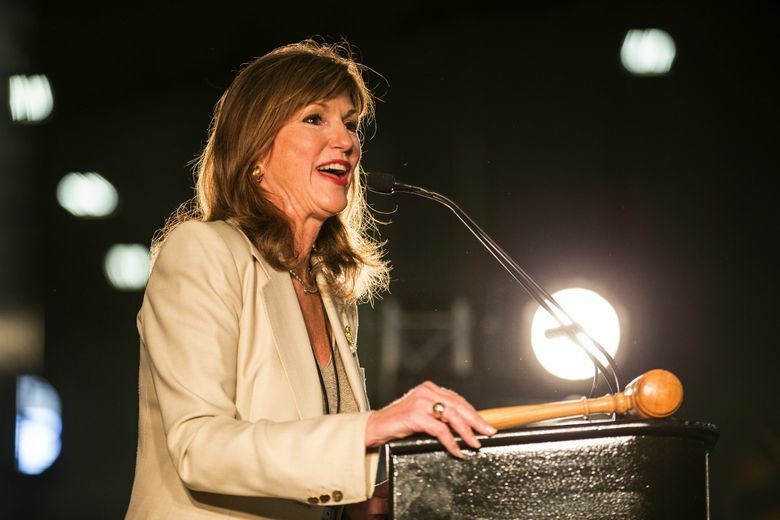 After state party leader Susan Hutchison seemed to rationalize the Trump audiotapes by saying he was a Democrat when the remarks were made, one of the GOP’s statewide candidates denounced Hutchison’s remarks. A former spokesman for the state party said she was “an embarrassment.” And a conservative talk-radio host called on her to resign. Josh Amato, a former state GOP spokesman who now runs a digital-marketing company that works with political campaigns, said Hutchison’s remarks were an embarrassment to state Republicans and GOP candidates up and down the ballot. He called the comments absurd. “We can be a big-tent party. But we can’t be big enough to condone or excuse sexual assault,” Amato said. Hutchison did say that Trump’s 2005 remarks — in which he bragged in vulgar terms about groping women — cannot be justified. But she then rationalized the remarks by saying Trump was a Democrat at the time. Hutchison did not return messages seeking comment Sunday, and a spokesman said she was unavailable. Caleb Heimlich, the executive director of the party, said anyone who thinks Hutchison was trying to excuse Trump’s comments is willingly misinterpreting what she said. He said Hutchison was simply pointing out that Trump’s comments were from another point in time in Trump’s life and that people change over time. “We like to believe that Mr. Trump has changed,” Heimlich said. He said he hasn’t heard from any elected officials or state board members who think Hutchison should step down, and he said any suggestion that she do so distracts from the party’s effort to mobilize before the election. “Mr. Trump took ownership of it and issued an immediate apology, and we were happy to see that,” Benton wrote. Todd Herman, a conservative talk-radio host on KTTH 770 AM, said in an interview Sunday that Hutchison’s explanation of Trump’s remarks could potentially harm Republican candidates across the state. The comments, Herman said, essentially say the state GOP’s official position is that if you talk about sexually assaulting women as a Democrat but later become a Republican, then it’s all OK. He didn’t understand why Hutchison would try to explain away Trump’s remarks when she has other candidates in the state who have sought to distance themselves from Trump. “Why are you expending political capital on a guy who has a 6 percent chance of winning (the state)?” Herman said. He also called on Hutchison to resign. Eric Minor, an RNC delegate from Gig Harbor who has long opposed Trump, said he was also very disappointed in Hutchison’s remarks because “she seemed to be justifying Trump’s conduct.” Minor has been frustrated with Hutchison ever since he felt like she squashed legitimate opposition to Trump at the party’s national convention. Minor also wishes Hutchison would resign. He doesn’t think that it would be wise to change party leadership this close to an election, but he pointed to the comments of King County GOP chair Lori Sotelo as an ideal way to respond to the Trump tape. Sotelo had issued a brief statement Saturday calling Trump’s remarks “unacceptable” and unrepresentative of the character of the party. U.S. Senate candidate Chris Vance, who has said for months he won’t vote for Trump, also said he did not approve of Hutchison’s remarks. Asked whether her remarks were harmful to the prospects of local Republican candidates, Vance sighed, then said he wasn’t sure. At the national level, some Republicans revoked their support for Trump after the tape was released. Others, however, have stood by Trump’s candidacy while denouncing the 2005 remarks.